Here at CuffWatches.Net we carry a unique collection of leather cuff watches, wristbands, leather accessories, leather jewelry, leather watchbands, leather cuffs, men cuff watches, ladies leather strap watches. We also carry one of a kind custom handcrafted leather cuff snap band watches and leather accessories. Check our collection of handmade leather wristbands, leather bracelets, braided leather bracelets in different colors and made with some of finest quality leathers available. Our leather choker selection offers wide range of styles. Unisex leather chokers, braided leather chokers, wide leather chokers in many custom sizes and styles. We are always adding new leather cuff watch styles, leather jewelry, sliver jewelry, leather necklaces, handcrafted bracelets,70's watches, fashion bracelets, leather wrist bands, bangle watches cuss watches and more. Each accessory is carefully checked for quality before it is shipped. At CuffWatches.Net we make custom handcrafted leather cuff watches of all shapes and sizes. Our handcrafted leather products are made with great care and quality. We have a great selection of handcrafted cuff watches for women too. Our ladies cuff watch styles come in a variety of styles. Great cuff watches for girls in hard to find styles. We have very unique styles in all of our watches. If you are looking to buy leather jewelry or leather accessories and don�t see what you want, send us an email. CuffWatches.Net is the best source on the internet for handcrafted leather cuff watches, leather strap watches, belt watches and leather accessories. Handcrafted cuff watches are definitely the hottest style right now and CuffWatches.Net has a large selection. We have excellent styles in fashion jewelry and custom leather cuff watches. Leather wristbands and leather bracelets available. Our watch styles for women are very unique and the watches are handmade with the highest quality craftsmanship. Each leather watch comes with a guarantee of quality from CuffWatches.Net. 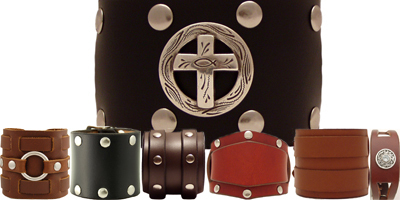 All leather cuffs are made in the USA.